Tous ces effets que tu peux tirer de la répétition (d’une image, d’un son). M’appliquer à des images insignifiantes (non-signifiantes). Flowers of Shanghai‘s (1998) interpretation of these three aesthetic principles – repetition, non-signifying imagery, and addition by way of subtraction – mark the film as perhaps Hou Hsiao-hsien’s most Bressonian effort, at least in its approach to narrative organisation. In Narration in the Fiction Film, David Bordwell describes several narrative forms of which one is termed “parametric narration”. Adapting this term from Noel Burch’s concept of “parameters”, or film techniques, Bordwell moulds it to his end of outlining a “style centered” narrational order, that is, one in which “style [is] promoted to the level of a shaping force in the film” (2). In order to elaborate upon the effects that this form has on the viewer, Bordwell cites E. H. Gombrich, who makes the distinction between “the perception of meaning”, associated with representational art, and “the perception of order”, linked to decorative and abstract art (3). A parametric film narrative, it is argued, leans the viewer towards the latter. As he develops this point further, Bordwell carefully refutes the commonly held belief that plot (or “syuzhet”) and style necessarily have a fixed relation to one another, offering the alternative view that they often waver in their importance in a film with a parametric narration. In fact, at different times elements of such a film’s style demonstrate varying levels of “arbitrariness” (4), such that some stylistic choices may not seem to be motivated by the concerns of the plot, whence their “decorative” quality. Tendering the example of a Cubist painting as evidence, the overall “meaning” of which is often overwhelmed by the “pure design” of its internal “spatial organisation”, Bordwell moves on to film and offers as a primary instance of a “style centered” narration Robert Bresson’s Pickpocket (1959). I will argue that this may also be extended to Hou’s Shanghai, a film that frequently overloads the spectator with stylistic subtleties and that challenges he/she to perceive the patterns of style it exhibits (5). In an effort to remain as close to Bordwell’s discourse as possible, Pickpocket will be our Bresson film of choice as well, although it must be said that our consideration of Bresson will be relatively brief, lasting only long enough to demonstrate the salient points of Bordwell’s argument and certain similarities between Pickpocket and Shanghai. Having said this, we will mostly be interested in Hou’s film, which virtually imprisons its narrative in ascetic stylistic paradigms. On broad terms, constraint is one of the principal characteristics of a parametric narrative, particularly as it works to develop a “theme-and-variation” pattern of style. As we examine these and other defining characteristics of parametric narrational organisation in the context of the two films offered here, one should remain mindful of our thesis: the play of style in these films is oriented around a model of “just-noticeable differences” (6) typical of the sparseness of the parametric form, meaning that both films develop a paradigm, a “sparse intrinsic norm” (7), which they set about modifying internally as their respective narratives unfold. In offering Shanghai as a Bressonian film, I simply refer to its self-imposed restraint, to its unusually limited range of stylistic preferences and to the “Bressonian” quality of some of these. Parametric narratives allow style to impose a sparse norm upon plot elements – upon what we see of them and what elements we actually see. Perusing Bordwell’s discussion of this narrational mode, we see four related traits: (i) order takes precedence over meaning; (ii) stylistic elements are repeated, recapitulated and slightly modified over the course of the film making it so that; (iii) plot patterning is organised in predictable ways so as to make noticing variations in the sparse or unified style a major part of the spectator’s encounter with the film; and (iv) the film exhibits a “preformed” or impersonal style unmotivated by theme or by demands of the plot. Over the course of this article, it will become evident how each of these traits comes into play either in the films as a whole or in specific parts of them. In Shanghai and Pickpocket, optical effects punctuate narrative transitions (8). In the latter, fades and dissolves segment and sub-segment the film’s 49 sequences (9), whereas the former’s narrative consists of 37 autonomous and semi-autonomous shots with each shot beginning and ending with a fade (10). Beyond being of note for their undeviating use of optical effects, Shanghai and Pickpocket use these conventional markers of ellipsis and narrative and shot transition points in ways that turn them on their ear. Hou and Bresson manipulate the device of the fade or the dissolve to deflect spectator attention away from the amount of time that has elapsed between segments and other such questions of plot and to direct he/she towards pondering the evolution of the film’s style. In the examples I shall offer here, the deployment of the dissolve or the fade calls attention to itself as a unique deployment of the technique and not simply as a customary movie plot transition. “Certain devices”, comments Bordwell on the narration of Pickpocket, “get pried loose from their codified role and move forward as pure parameters” (11). As a result, order and style are privileged over meaning and plot. Shanghai‘s fades call attention to themselves from the start by virtue of the methodical pace at which they unfold. The most accurate way to measure the duration of a fade is by frame, but in the absence of this, suffice it to say that Hou’s fade must rank with the slowest among active narrative filmmakers. Since the film contains not one straight cut, the choice to end a shot must be carefully timed for it means the appearance of a slow fade. Hou has elected to compose the film predominantly with sequence shots and therefore to do away with shot–countershot editing patterns, montage sequences and, aside from the lone point of view shot (discussed below), with analytical editing, each of which needless to say would have been at odds with the film’s redundant application of fades to demarcate shot-to-shot transitions. In most of the transition points in Shanghai, stylistic consistency and plot development operate with mutual importance. Consider the first nine shots of the film. The first shot (or segment) shows the film’s first of four banquets hosted, I believe, by Master Hong (Luo Tsai-erh). The next eight shots are then paired off according to unity of place and character. The first two shots are set at Huifang Enclave and concern Crimson (Michiko Hada). The proceeding two shots concentrate on Pearl (Carina Lau) and take place at Gongyang Enclave. Shots 6 and 7, set at Shangren Enclave, focus on Emerald (Michelle Reis), and the last two shots occur at East Hexing Enclave, home to Jasmin (Vicky Wei). The fades that segregate the movement to each new location, in what can be taken as the film’s exposition, work quite conventionally, facilitating transitions to new segments that will introduce us to each separate plot strand and to relatively distinct groups of characters. Within these coupled sequence shots, it is even possible to piece together the amount of time that has elapsed during the fade – a characteristic of a rudimentary or classical employment of the fade device. Because these expository shots are divided over a few locales, one is prompted to contrast two successive shots set in the same place and to establish between them their spatio-temporal kinship. Shot 4 introduces us to Pearl, who, as the daughter of the “Auntie” of Gongyang Enclave (Rebecca Pan), holds a position of authority in the house. She is seated at a small table in the centre of the room, smoking opium. Master Hong, last seen in Shot 2 accompanying Master Wang (Tony Leung Chiu-wai) to his meeting with Crimson at Huifang Enclave, attends her, seated on the far left of the room. As they discuss the turmoil between Treasure (Lin Yu-han) and Jade (Fang Hsuan), we discover in medias res that Jade had, as a result of her last altercation with Treasure over a hookah, become ill and not left her bed yet on that day. The shot comes to an end as an offscreen male voice yells out “a booking for Mistress Jade.” Fade out. Fade in to a slightly different camera set up, always in the same room. The table at which Pearl was seated is now empty as two servants move about arranging objects; no other figures are visible. For the moment, questions about when and even where we are situated are displaced by the actions of the servants. Hong, a few seconds later, enters the room from the background and the camera follows him, panning left to reveal the presence of Pearl, still smoking opium, seated in the exact same chair Hong had been seated in prior to the fade. Hong mutters a few comments about Jade refusing to go (to her booking), but that he managed to convince her. 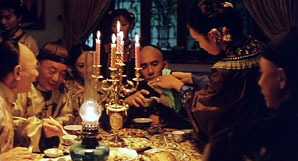 The episode elided by the fade allowed enough time for Hong to decide that he should act and pay a visit to Jade in order to persuade her that she should accept, but was not so long as to unfold before Pearl, who decided to change seating positions, had time to finish smoking her opium. In this instance, the fade separating these two shots raises questions about plot elements left unseen and the syuzhet relation between the shots; its narrative significance holds its ground with its plastic characteristics. The style of this film is not that of a thriller. The author attempts to explain, in pictures and sounds the nightmare of a young man, forced by his weakness into an adventure in theft for which he was not made. Yet this adventure, by strange paths, brings together two souls, which otherwise might never have been united. The highlighted portions, de-italicised by me, draw our attention immediately to technique, “coaching” the spectator from the top and not waiting for he/she to discover that the narration to be presented here will be a style-centred one, as is partially the case of the preparatory or expositional first nine shots of Shanghai. Bresson’s narrative is famously peppered with gaps, ellipses and moments that are overtly elusive. There is, however, one constant: for the most part, what we see is forged by what we hear from Michel’s written record. The character’s voiceover commentary and diegetic writing very much order the narrative; 36 of the 49 sequences, Bordwell records, bear the mark of Michel’s interjections (14). But his is not the final word. As Bordwell forcefully argues, it is the film’s opening title card and the extra-diegetic narration that it represents that curtails Michel’s power over the plot. This is evidenced by the film’s ending, which does not return to and close Michel’s account or text but leaves it open. In a gesture that, on first glance, gives the film an asymmetrical feel, we do not conclude with Michel’s thoughts on these events. In point of fact, however, the film presents a perfect symmetry, beginning and ending with a non-diegetic narrational “voice” – the same “voice” as the crawl title that explicitly draws one’s attention to the “how” of the film over the “what”. Using a “sparse” approach, the film selects only a few technical procedures from the classical paradigm. These devices become organized into additive, spatialized form that coheres as a unique stylistic world. Pickpocket‘s intrinsic norm thus achieves prominence by virtue of its narrow range of technical choices, its quantitative repetition of those, and its qualitative subordination of Michel’s recounting to stylistic patterning (15). One hardly needs to press the point that this description, albeit it with certain slight variations, could be made to convey the narration of Hou’s film as well. The progress or development of style becomes temporalised within the narration encouraging viewer awareness of repetition and change. One specific device with which Pickpocket plays is the optical effect. The narration consistently experiments with the effects of dissolving in the middle of a line of dialogue or an act. As a means of establishing some points of familiarity for the viewer, thus providing the platform that will make odd manipulations of other optical effects apparent, the narrative intermittently makes use of the manner in which such devices are deployed along the guidelines of a more classical paradigm. The film’s first section, after the initial shot of the protagonist writing, culminates in a rather rudimentary fade marking the end of Michel’s day. Michel lies down in his bed, his voiceover confirms his exhaustion (“J’étais mort de fatigue et dormis jusqu’au matin”); we fade out and then fade in to the next shot that sees him, the next day (we assume), getting off a streetcar. In this instance, the optical effect assists the transmission of plot information, easing our transition to the next stage and communicating ellipsis without causing disorientation or calling attention to itself as a technique. But prior to this, we had been privy to a series of dissolves, delivered at a quick pace and in bizarre locations. Beginning after the film’s first diegetic shot of Michel recording his thoughts, this section consists of 21 shots, the initial 15 taking place at the racetrack, showing Michel taking money from a woman’s purse and then attempting to escape. In Shot 15, two men follow Michel. Dissolve to 16, a shot of Michel seated between the two men in a moving car. Dissolve then to a shot of Michel, back to the camera and in the police inspector’s office. In the remaining shots, released from custody due to lack of evidence, Michel returns to his sparsely furnished apartment and goes to sleep. These first shots reveal a strategy that the film will go on to develop and utilise more strikingly. The découpage of the scene at the racetrack presents an “impalpable” style, representing Michel’s first theft in a familiar rhythm of glances, point of view shots and close-ups, and in which the harmonious rhythm is achieved by way of smooth shot transitions, thus allowing plot patterning to come forward (16). In what happens after, though, the seeds are planted for the slow conquest of the plot by style. The qualities of Bresson’s dissolves themselves are unremarkable, but that does not make their deployment any less “decorative”. In what would have taken a more conventional narrative several minutes of screen time to show, the pursuit of Michel by the arresting officers, the arrest itself, and Michel’s subsequent release is sliced through in Bresson’s film in no more than 30 seconds. The dissolves are entirely responsible for this narrative thriftiness, cutting the pursuit short (with the assistance of Michel’s voiceover in Shot 16, which announces that he had been caught “a minute later”) and denying us: (i) access to Michel’s reaction at being caught; (ii) the benefit of an establishing shot that might reveal to the viewer where Michel had been taken (and even by whom he had been taken, which remains a question until dialogue in Shot 17 provides the viewer with a few helpful clues); and (iii) knowledge of what had happened in the interrogation of Michel that we assume to have taken place during the dissolve between Shots 16 and 17. The broader significance of these shots, of the rudiments of story that they omit, can only truly be pieced together in retrospect. As they unfold “live”, the spectator is not granted the time to analyse them as discrete elements, meaning that they either lead to confusion or are reduced to the “bare bones” of what the narration presents us with directly. I would suggest here that the perception of meaning, while certainly a factor, is subordinated in this section of Pickpocket (and others) to the perception of order, with the “content” of the shots being of less intrigue than their spatial organisation. From the preliminary segments, then, we immediately grasp the film’s impetus to curb spectator focus away from the events of the plot, whose pattern will at times be derailed by the narration’s desire to play with the restricted range of parameters it has selected, and toward palpable manipulation of these specific elements of style – in this case, dissolves. What we see will be filtered through style as it competes with the plot for viewer attention. Bordwell goes into much greater depth on the subject of Pickpocket‘s parametric narration and its concomitant stylistic variations and repetitions than I am able to here. I refer the doubting reader to his sections on Bresson’s “defamiliarisation” of the shot–reverse shot device (pages 293 to 298) and the subtle spatial modifications in the almost tiresome tendency of the narration to linger on hallways after characters have left the frame (pages 301 to 304) as further evidence of the film’s sparse stylistic norm. Furthermore, Bordwell notes that, due to the stylistic “regularities” that the film creates, “various cafes and rooms become extensions of the same rudimentary locales” (17). This, I hypothesise, is what occurs in Shanghai, in which the various rooms and enclaves lose their distinctiveness unless the viewer remains unusually conscious of certain subtle visual cues that are themselves prone to a “theme-and-variation” rhythm. Locating where we are is a game that Hou’s film asks us to play. The safest way to orient oneself is by identifying characters, but this at times is rendered insufficient and misleading (again, this is an example of the “power” of the film’s style). Master Hong, as the thread that ties all three major narrative strands together, is an unreliable visual compass. He makes appearances at all four enclaves, and shots such as Shot 5 (discussed above), that see him move into a frame otherwise populated with nondescript attendants, are temporarily unidentifiable in terms of location. One attendant who is not so nondescript is Azhu (Lee Yu-ming), who is virtually always present in the Crimson scenes and immediately identifiable for, among other things, always calling offscreen to other attendants, asking them to bring food or tea or other such items. Other factors that render these locations similar are lighting, decor and overall shot composition. The four main flower girls’ chambers, along with that of Jade, are dimly lit, with lamps sporadically scattered about them casting golden light. (This, it goes without saying, does not apply to those few shots that depict scenes that take place in the daytime, characterised by horizontal light coming in from the windows, such as Shot 22. [See below for a partial shot breakdown of this film.] These are the exceptions that, quite fittingly, prove the rule.) Very often we will fade into shots that have small banquet tables at their centre, the lamps on these tables projecting the brightest light in the room and acting as a nucleus for the scene’s action. Because this becomes a fairly consistent norm and a visual composition that the spectator expects, variations (minute or enormous) in lighting, decor and overall composition (due especially to changes in camera set-up) can result in brief moments of disorientation in which the viewer is asked to re-orient him/herself based on their ability to perceive these changes in technique. Shots set in separate locations, moreover, have their own distinguishing stylistic features and norms and variations on them that the viewer (futilely) scrambles to register over the course of the film. Crimson’s scenes are never shot in “daylight”. One significant change in lighting in her chamber occurs in Shot 19, in which a light emanating from under a door in the background, present for the time, draws viewer (and Master Wang’s) attention to that area of the room. In terms of character movement in the Crimson scenes, the viewer is prompted to take note of their motion and stillness, as is the case of all the scenes, but here a rhythm of “cat-and-mouse” movement is established with Wang and Crimson as they alternate the roles of pursuer and pursued within each segment and over the course of many. Wang sits next to Crimson; he moves away. Crimson moves to sit next to him; she moves away. Crimson and Wang sit away from each other. Such is the “map” of character movement in Shot 11. An intriguing “echo” in body posture also characterises two of the Crimson segments. In Shots 11 and 13, respectively, two successive episodes set at Huifang Enclave (separated only by one shot set at Gongyang Enclave), Crimson and Wang sit hunched over and facing away from the camera in the background of the shot, expressing their grief in identical ways. Pearl’s segments create their own intrinsic norm by offering only relatively minute changes in camera set-up. This is certainly the case as compared to the changes in the Crimson and Emerald segments, in which the camera is, at varying moments, inside or outside the flower girls’ rooms and willing, furthermore, to shoot from set-ups perpendicular to as much as two or three of the rooms’ walls. In Pearl’s segments, the camera remains, for the most part, bolted to the same spot, a set-up perpendicular to the wall with the entrance, making possible one of these segments’ principle strategies: the capturing of movements of barely discernible characters through the room’s window (next to which Pearl is seated in Shot 5). Moreover, a unique staging pattern develops in Shots 35 and 36, the last two shots set at Gongyang Enclave and involving Pearl. In what might be termed a “ping-pong” pattern to actor movement, Master Zhu (Chiang Wei-kuo), as self-appointed “matchmaker” for his nephew Shuren (Simon Chang) and “middleman” in the marital negotiations between his nephew and Jade’s representative, Pearl, “ping-pongs” back and forth between the two figures. This “toing and froing” gives these two segments their internal rhythm. Slight variations in profilmic elements – alongside the filmic – are detectable in the banquet scenes. Below the immediate level of the familiar (a recognisable loop of drinking, party games and exchange of the latest gossip), we might excavate a layer of just-noticeable differences in character presence, performance and sound. Masters Hong, Luo (Jack Kao), Zhu and Wang at least are always present (except for Wang, who is absent only from the fourth). Crimson makes only one appearance, in the second banquet. Jasmin makes important appearances in the first and third, the latter of which is particularly interesting because of the presence of (diegetic) opera music on the soundtrack. Earlier in the film, it had been mentioned that Jasmin was fond of opera. Intriguingly, the music of the third banquet seems to echo into the proceeding segment, not aurally but in the form of influencing Master Wang’s erratic behaviour. It might be argued, in consideration of these juxtaposed segments, that Wang’s sombre demeanour in the later half of the third banquet reflects a growing concern for the absent Crimson, whom Wang then goes to visit in the next shot (Shot 19). Perhaps in his drunken stupor, the opera music he had just heard, reminding him of his infidelity and infidelity in general, causes him to believe that Crimson was cheating on him – with an opera actor. Actor Tony Leung’s performances at each successive banquet call for comparison as well, as he alternates between distracted indifference (the first banquet and the second half of the third) and delighted engagement (the second and the first half of the third). These last examples, referring to changes in human behaviour (whether character or actor) are more likely to be found in classical films, in which, in Bordwell’s words, “repeated camera set-ups serve as a neutral ground for changes in the human agents” (18). However, all of these points of constancy and change are brought to light for the most part due to the extreme redundancy of the film’s fades and the organisational role they play. Up to the end of Shanghai‘s ninth shot, despite their unusual duration and our awareness that there have thus far been no cuts, fades function rather harmoniously with the plot. In other passages, however, the deployment of fades and the stylistic patterns that they follow compete with, and perhaps take charge of, the plot. In these instances, the narration stylises the depicted events. This is the crux: the first nine shots create a perceptible rhythm. This rhythm is then challenged by what comes after – a serial structure that not only challenges the spectator’s ability to follow the action and to grasp where it is set but uses the relative spatio-temporal disorientation of the spectator to draw his/her attention to patterns of stylistic change rather than to plot development. In fact, one of the ways that Hou manages to disorient the viewer, aside from making the fades increasing unreliable to denote changes in location (and even significant temporal ellipses!) is by forcing the viewer to navigate the stylistic changes that form the window through which we eavesdrop on these several – otherwise familiar – settings. Master Wang’s subjective point of view shot, Shot 20, constitutes perhaps the most extreme experiment with the fade in Shanghai. While stamped with character subjectivity, the shot hits the spectator first and most forcefully as a stylistic event by virtue of the constraints the film had hitherto imposed upon itself. More specifically, the POV and its accompanying fades strike one as an event in three main ways. First, the shot does not clarify some detail or other of character or plot. While this point of view insert becomes integrated into the plot, the pressures of plot development only nominally motivate it. The parametric narrative of Shanghai, playing as it does with the denotative and connotative powers of the fade, produces this jarring gesture as a variant of its previous stylistic experiments. Let us pause for the moment to concede that Master Wang’s reaction to what he saw (in the POV shot), his angry demolition of Crimson’s possessions, is itself due to a misinterpretation of what he had seen. What Wang thought he saw is a matter of speculation, but clearly it led him to believe that Crimson was having an affair with an opera actor. The shot itself shows very little in its 12-second duration and certainly not enough to suggest Crimson’s involvement with an actor. 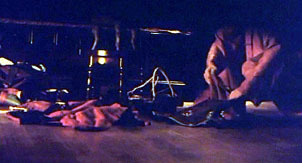 A camera low to the ground shoots some garments strewn at the foot of a bed followed by the feet of a figure (a woman?) scampering about while (she) picks up some these articles of clothing. The content of the insert itself is swarmed in ambiguity – an ambiguity that becomes acknowledged later in Shot 24 (20). As it hampers the plot by presenting the viewer with unclear, ambiguous or inconclusive information the viewer is forced to retreat to the comfort of comparing what he/she has thus far learned about the film’s style with this new and unique variation of that style. Differently stated, the nebulous quality of the shot creates a space that heightens viewer awareness of how fades are being used and of the oddness of the shot itself. While it is plot motivated in that it triggers (i) Wang’s outburst and (ii) a later scene in which Wang is made aware of his hasty conclusion, we only later learn that he falsely interpreted what he had seen, such that as the spectator sees the shot for the first time, its meaning is shrouded and made secondary to its decorative qualities. En passant, a similar strategy of depriving shots of informational content in order to re-orient the viewer toward style is on hand in Pickpocket, only in different form. On top of the example cited above, in which shot content is made secondary due to the quick delivery of a couple of dissolves, Bordwell notes that the performance of Bresson’s models, in this case of Martin Lasalle as Michel, bring parametric operations to the fore. “When each character wears a blank face and stands motionless or walks without idiosyncrasy”, he remarks, “the repetitions of camera setup come forward to a greater degree” (21). The prism is therefore turned away from plot. Second, by convention, filmmakers largely exercise all possible precautions to ensure that POV shots flow with the action and the shots that come before and after in the editing scheme by making shot transitions between these elements as “imperceptible” as possible – by covering their tracks, as it were. But in Shanghai‘s anomalous POV shot, fades bookend the insert itself, creating a peculiar effect. Summarising a familiar tendency, Bordwell and Thompson state that “[t]he Hollywood ‘rule’ is that a dissolve indicates a brief time lapse and a fade indicates a much longer one” (22). Fades, on conventional terms, violate the temporal order of a narrative and cue the viewer into this fact. But in Shanghai Hou rewrites the fade, using it in this particular segment, in the case of the transitions from Shot 19 to 20 and from Shot 20 to 21, to suggest simultaneity; although there is a change in camera set-up between Shots 19 and 21, there is no change in Wang’s body position as he is peeking under the door frame in both shots, meaning that there is no discernible temporal gap between them. Both fades, occurring within 15 or so seconds of one another, violate the Hollywood norm and the “system” that the film itself had worked to establish; the stylistic paradigm that the film locks itself into requires the use of fades and gives birth to this stylistic “happening”. Third, qualities of the fade out of Shot 20 and fade in to 21 make of this the most unique among Shanghai‘s fades. Simply put, it is significantly shorter than the rest – a fact that might be explained as coinciding with character (Master Wang’s) reaction. As Shot 21 begins, Wang, on his knees, leaps back and onto his feet in shock at what he believes to have seen; the fade seems to accommodate this (23). While we certainly get a routine Shanghai-style snail fade out of Wang’s optical point of view, the fade back in to the shot of Wang peeking under the door is stunningly abrupt. In fact, for the first and last time in the film a fade is not permitted to complete itself as it opts for a fade out followed by something of a shock cut in. All of these factors are amplified by the peculiar quality of the framing. In moving from a long shot (of Wang in the background on his knees and peering under a door) to a close-up (his optical POV) and back to a long shot (and a new camera set-up), this pattern of relatively extreme shifts in distance of framing reveals itself as an anomaly. Only one other instance in the film prepares us for this and it is once again linked to Wang’s point of view – this time, perhaps psychological. As aforementioned, Shot 10 begins to break the design that the film had worked to establish. The shot is startling for other reasons as well – reasons that also have to do with upsetting stylistic norms. In many ways, this shot prepares us for the subjective nature of Shot 20. In fact, the case might be made that this shot (Shot 10) and the manner in which it is composed is far more “experimental” than this other one in the context. Shot 8 sees Masters Hong and Wang eating as Jasmin discusses the new emerald hairpin that she plans to purchase. Fade to Shot 9, a scene where, alone now, Jasmin and Wang discuss Crimson. As we fade in to Shot 10, the film’s lone voiceover appears on the soundtrack. Over a shot of an emerald hairpin on Crimson’s table, we hear Wang musing about his relationship with her (“When I began calling on Crimson, she told me ‘[a] really good gentleman caller is every flower girl’s dream’”). The shot itself, the film’s second shortest, lasts 16 seconds. During the fade to Shot 11, Wang’s voiceover continues (still citing Crimson: “’Now that we have met, I need no other caller’”) and only ends several dozen seconds into Shot 11, when it is interrupted by words spoken by Crimson’s attendant, Azhu. Taking all this into account, might it not be claimed that Shot 10, which I have recorded for convenience’s sake as being “set” in Huifang Enclave, is in fact a psychological insert produced in the mind of Wang? The fact that it comes only 35 minutes or so into the film perhaps compromises the intensity of its impact as a stylistic gesture. Nevertheless, it is further evidence to support our claim that Hou is “playing” with the significance and decorative qualities of the fade in this film. By framing this (psychological?) insert with fades, framing the fades themselves with shots (9 and 11) that confuse any attempts to comfortably determine the owner of the perspective (which Hou then smoothes over with the voiceover narration), and, more generally, by inserting the POV shot into a film with a sparse intrinsic norm, Hou has introduced a relatively unfamiliar editing scheme into an otherwise controlled environment and imbued a codified device with a stylistic forcefulness that it does not usually hold. Shanghai‘s narration begins by utilising fades to segment relatively complete or independent scenes or episodes of the plot, in which the elliptical function of the device, for the most part, remains intact. As it progresses, however, it comes to deploy them as links for increasingly dependent or fragmentary narrative shards, whose temporal identities and relations begin to erode and become difficult to quantify. This is as much the case for Master Wang’s subjective as it is for Shots 25, 26, 27 and 28, which might be taken as “stages” in or symbolic references to one episode. In this section of the narrative, concerned with the assessment of the value of Emerald’s personal belongings, we come as close as we will to having a montage sequence in the film. However, what seems to prevent this series of shots from constituting one harmonious segment are, paradoxically, the fades that link them (in conjunction with other stylistic elements, like shot duration, sound, the presence of dialogue and so on, which we will not discuss here). The deliberateness of the fades combats how the plot seeks to group these segments (or shards) and isolates them despite one’s urge to combine them. Pickpocket, for its part, uses both fades and dissolves as stylistic cues to assist one to distinguish between relatively long and short ellipses, but also to demonstrate how segments organise themselves at the segmental and the sub-segmental level, with dissolves working to organise shots with segments and fades working to organise the relations between two complete or relatively complete shot-groupings or segments, whereas Shanghai provides us uniquely with fades and thus with a breed of optical effect that is not helpful in this particular case. Moreover, at this late stage in Shanghai‘s narrative, the viewer has no identifying title cards to rely upon. As a result of these and other factors, this series resists one’s urge to count it as a whole. But it might be even more precise to state the problem as follows. The combined effect of these disparate yet related events, generally pre-occupied with calculating Emerald’s assets before she leaves Shangren Enclave and the life of the flower girl behind her, and the fades that segregate them, “somehow” ends up floating in narrative limbo between wholeness and fragmentariness, between being taken as a segment unto itself and a series of autonomous segments, as the viewer experiences them while the film is being projected. Neither the profilmic plot elements of Shanghai and Pickpocket, derived from Han Ziyun and Dostoyevsky respectively, direct the play and place of optical effects to be witnessed in these films. In that way, these films are re-orchestrations of the original source material – re-interpretations along the lines of new stylistic rhythms. Differently stated, on Bordwell’s terms, the repetitions and slight variations in style that the narratives produce are “beyond the dictates of the syuzhet” (24). Hou’s and Bresson’s films are comparable in the manner in which they consistently – even predictably – use optical effects as transition devices in their narratives in order to establish a constant rhythm and then in the way they eventually subvert this common usage by juggling certain elements of style and thus producing slight and even significant permutations. In the increasingly “nonsignifying” effects that it uses, Shanghai is, as Bordwell suggests of Bresson’s film, “closer to music than to the novel” (25). Storytelling is, at points, overshadowed by evolution of style in these minimalist works. Almost any given space in Flowers of Shanghai – the dinners, the visits to the chambers of the various flower girls – is multi-planed, jewel-like, bewitching. The ancient Chinese aesthetic concept of liu-pai – allowing what’s visible within the frame to open out in the mind of the viewer onto the world that extends beyond its parameters – is expanded in the new films, where space at times feels as if it could spring into any direction (28). Setting aside Jones’ less specialised deployment of “parameters”, his point is well taken. To translate his viewpoint into our present lingo, Shanghai‘s “decorative” stylistics challenge the viewer’s memory, beggaring one’s ability to stockpile its internal rhythms or plethora of repetitions and variations. And in challenging the viewer in this way, the film, Jones seems to argue, deflects he/she away from what is actually seen to be pondering what “lies beyond”. I would claim, however, that the scrambling viewer is left with two options (not one): to float outside the film in the misty, boundless nebula of connotative rumination, which seems to engulf Jones, or to attempt to meet the film’s challenge and to keep up with its decorative “themes” and its difficult yet perceptible internal order. “I’ve heard that Flowers of Shanghai is difficult to follow, that there are too many characters to keep track of”, confesses Jones. “In fact, what there is of the story is very simple”, he continues, just prior to summarising the film’s plot (29). But this response to the confusion the film generates misses the point. To attempt to remain focused on plot while viewing the film is to resist appreciating its true accomplishments. Such a reaction would be fruitless and lead only to abandonment. One reads not Hermann Broch’s The Death of Virgil merely for the “what” but for admiration of the “how”. The same applies in film to other masters of parametric narration: Ozu, Tati, Dreyer, Mizoguchi and, on a more experimental level, Michael Snow (30). At times, their films have the gall to even mock plot patterning and, more resonantly, to render mute attempts to clumsily lump plot motivation onto clearly impersonal or decorative, which is not to say whimsical or insubstantial, stylistic preferences. Raymond Bellour, “Segmenting/ Analyzing”, Narrative, Apparatus, Ideology, Philip Rosen (ed. ), Columbia University Press, New York, 1986, pp. 66–92. David Bordwell, Making Meaning: Inference and Rhetoric in the Interpretation of Cinema, Harvard University Press, Cambridge, MA, 1994. David Bordwell, On the History of Film Style, Harvard University Press, Cambridge, MA, 1999. Robert Bresson (1977), Notes sur le cinématographe, Gallimard, Paris, 1997. Noel Burch, Theory of Film Practice, trans. Helen R. Lane, Princeton University Press, Princeton, NJ, 1981. Colin Burnett, “Segmenting Welles’ The Trial: Optical Effects, Doorways, and Narrative Segmentation” (forthcoming). Lee Ellickson, “Preparing to Live in the Present: An Interview with Hou Hsiao-hsien”, Cineaste, vol. 27, no. 4, September 2002, pp. 13–19. Jean-Michel Frodon (ed. ), Hou Hsiao-hsien, Éditions Cahiers du cinéma, Paris, 1999. Stanley Rosen, “Interpretation and the Fusion of Horizons: Remarks on Gadamer”, Metaphysics in Ordinary Language, Yale University Press, New Haven, CT, 1999, pp. 182–201. Stanley Rosen, Nihilism: A Philosophical Essay, St. Augustine’s Press, South Bend, IN, 2000. Stanley Rosen, “Theory and Interpretation”, Hermeneutics as Politics, second edition, Yale University Press, New Haven, CT, 2003, pp. 141–174. Robert Sklar, “Hidden History, Modern Hedonism: The Films of Hou Hsiao-hsien”, Cineaste, vol. 27, no. 4, September 2002, pp. 11–12. James Udden, “Hou Hsiao-hsien and the Poetics of History”, Cinema Scope, Spring 2000, pp. 48–51. James Udden, “Hou Hsiao-hsien and the Question of a Chinese Style”, Asian Cinema, vol. 13, no. 2, Fall/ Winter 2002, pp. 54–75. Jerry White, “Taking the Island to the City: Hou and Zhang in Comparison”, Cinema Scope, Spring 2000, pp. 45–47. These are cited from the director’s Notes sur le cinématographe. See Robert Bresson (1977), Notes sur le cinématographe, Gallimard, Paris, 1997, pp. 59, 23 and 96, respectively. David Bordwell, “Parametric Narration” in Narration in the Fiction Film, University of Wisconsin Press, Madison, WS, 1985, p. 279. Bordwell, p. 283; italics from original. An analysis of filmic narration is a unique species of analysis in that it attempts, in systematic or semi-systematic fashion, to make use of both traditional textual analysis and the hermeneutical study of viewer awareness and general intentionality, or the spectator’s perspective, and the meeting point between these forms. It tries to account for how meaning is made over the course of a film, what “meanings” are made, and how the meaning made follows the “hints” left by the text. While I am certainly aware of the problems of generalising about some “universal” spectator and his/her encounter with a specific text (“I” may not notice things that “another” does or vice versa), I think that the analysis of a film’s narration, and the fruits that it bears regarding – on the one hand, the style and plot organisation of a given filmic text and, on the other, the way spectators generally receive and make meaning out of these conventional elements – is well worth the risk. Of course, as the reader will hopefully note, responsible analysis of film narration circumvents a battle of opposing and arbitrary perspectives about how a film works by, in philosopher Stanley Rosen’s words, basing all claims, whenever and however possible, on what the text itself “testifies” – a simplistic formulation, but a good policy (“Interpretation and the Fusion of Horizons”, p. 183). My approach to the analysis of film narration believes, in accord with Rosen’s hermeneutics, that texts and people’s interpretation of them are intelligible, or, along Rosen’s reasoning: “A work of art can be interpreted in many ways. But something underlies this variety that is not itself merely a variable” (p. 198). Although Rosen is adamant about the inherent openness of art, he very delicately argues that openness or indeterminacy do not make of interpretation an unbounded process: “There must be a work of some definite sort about which we can say accurately that it is open. A work of art cannot be sheer openness or pure possibility; to take this line is to define presence as absence” (p. 196). “Just-noticeable differences” is a term first used by Bordwell in Narration in the Fiction Film, p. 286. “Bresson […]”, remarks Noel Burch, “uses [dissolves] as a structural element, as both a rhythmic and a plastic entity […]”. See Noel Burch, Theory of Film Practice, trans. Helen R. Lane, Princeton University Press, Princeton, NJ, 1981, p. 42. This is the quantity as enumerated by Bordwell, p. 291. The terms “sequence”, “scene” and “episode” will be used in this current article to denote the same conditions and will not be limited to Metz’s specialised usage. Lou Ellickson states erroneously that “the film includes only thirty shots”. Unless there is another shorter version of Flowers of Shanghai available that I am unaware of, this statement is simply inaccurate. See Lee Ellickson, “Preparing to Live in the Present: An Interview with Hou Hsiao-hsien”, Cineaste, vol. 27, no. 4, September 2002, pp. 13–19. Bordwell states in Pickpocket‘s case that: “[i]t is necessary for the narration to geometricise syuzhet patterning in predictable ways to establish unity of style and to prompt the viewer to perceive repetitions, disjunctions, and differences in parametric handling”. See Bordwell, p. 305. Evidence provided in Shot 12, in the form of an exchange between Master Hong and Pearl, in which he invites her to a banquet thrown by Master Luo and taking place at Shangren Enclave, demonstrates the location of the second banquet. The third and fourth take place at the same location. David Bordwell, and Kristin Thompson, Film Art, fifth edition, McGraw-Hill, Montreal, 1997, p. 299. Once again, while we may be able to retroactively account for potential plot motivation for certain stylistic choices thus making the film’s style only moderately decorative, it remains, I judge, that on first viewing this fade in particular creates a jolt in the spectator not because he/she sympathises with the character (an unavailable option due to the confusing nature of the POV itself), but because of awareness of a stylistic choice that deviates from the film’s established norm. Kent Jones, “Cinema with a Roof Over its Head: On the Latter Day Films of Hou Hsiao-hsien”, Film Comment, September–October 1999, no pagination. Bordwell mentions these practitioners of parametric narration on pages 284 to 287 of Narration in the Fiction Film.